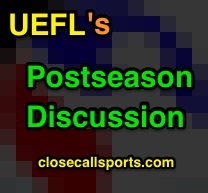 Discussion for the 2017 postseason's AL and NL Division Series is open. Home plate umpire performance is listed following the completion of each contest according to pitch f/x and UEFL Rules 6-2-b-a (horizontal bound, "Kulpa Rule") and 6-2-b-b (vertical strike zone, "Miller Rule"). Fouls, swinging strikes, balls batted into play, and hit-by-pitches are excluded from the analysis, while the remaining callable pitches are organized by type: "ball" or "called strike." Plays include significant plays and instant replay reviews, if such plays occur. Call +/- also included/highlighted. - 10/05, BOS@HOU Gm 1: Dan Bellino: pfx. 98/101 Balls + 57/60 Strikes = 155/161 = 96.3%. +2 HOU. - 10/05, NYY@CLE Gm 1: Vic Carapazza: pfx. 110/113 Balls + 52/55 Strikes = 162/168 = 96.4%. +0. - 10/06, BOS@HOU Gm 2: Angel Hernandez: pfx. 113/116 Balls + 46/53 Strikes = 159/169 = 94.1% +2 BOS. - 10/06, NYY@CLE Gm 2: Dan Iassogna: pfx. 141/143 Balls + 68/75 Strikes = 209/218 = 95.9%. +1 CLE. - 10/06, CHC@WAS Gm 1: Cory Blaser: pfx. 70/72 Balls + 47/49 Strikes = 117/121 = 96.7%. +0. - 10/06, ARI@LAD Gm 1: Paul Nauert: pfx. 115/118 Balls + 38/43 Strikes = 153/161 = 95.0%. +0. - 10/07, CHC@WAS Gm 2: Ron Kulpa: pfx. 98/102 Balls + 37/41 Strikes = 135/143 = 94.4%. +2 WAS. - 10/07, ARI@LAD Gm 2: Phil Cuzzi: pfx. 105/111 Balls + 54/60 Strikes = 159/171 = 93.0%. +0. - 10/08, HOU@BOS Gm 3: Ted Barrett: pfx. 105/108 Balls + 40/46 Strikes = 145/154 = 94.2%. +1 HOU. - 10/08, CLE@NYY Gm 3: Dana DeMuth: pfx. 87/89 Balls + 29/31 Strikes = 116/120 = 96.7%. +2 NYY. - 10/09, HOU@BOS Gm 4: Mark Wegner: pfx. 121/122 Balls + 48/52 Strikes = 169/174 = 97.1%. +1 BOS. - 10/09, WAS@CHC Gm 3: Fieldin Culbreth. pfx. 97/99 Balls + 40/42 Strikes = 137/141 = 97.2%. +0. - 10/09, CLE@NYY Gm 4: Brian O'Nora. pfx. 115/118 Balls + 61/64 Strikes = 176/182 = 96.7%. +0. - 10/09, LAD@ARI Gm 3: Gerry Davis. pfx. 109/111 Balls + 49/54 Strikes = 158/165 = 95.8%. +5 ARI. Series Complete: ALDS HOU Over BOS 3-1, 95.4%, 628/658, Net Skew: +0 Neutral. Series Complete: NLDS LAD Over ARI 3-0, 94.6%, 470/497, Net Skew: +5 Arizona. - 10/11, WAS@CHC Gm 4: Laz Diaz: pfx. 84/87 Balls + 52/57 Strikes = 136/144 = 94.4%. +4 CHC. - 10/11, NYY@CLE Gm 5: Jeff Nelson: pfx. 97/99 Balls + 60/68 Strikes = 157/167 = 94.0%. +2 NYY. Series Complete: ALDS NYY Over CLE 3-2, 95.9%, 820/855, Net Skew: +3 New York. - 10/12, CHC@WAS Gm 5: Jerry Layne: pfx. 129/134 Balls + 50/55 Strikes = 179/189 = 94.7%. +0. Series Complete: NLDS CHC Over WAS 3-2, 96.4%, 704/730, Net Skew: +2 Chicago. NOTE: The highest plate score during the 2016 Division Series was Brian Knight's 96.9% (ALDS B1). The highest plate score overall during the 2016 Postseason was Jim Wolf's 98.6% (ALCS Game 2). - ALDS B1: HP Umpire Dan Bellino's time play ruling of "no run" prior to the third out is reversed. - ALDS B1: LF Umpire Mike Everitt's out ruling is overturned to a trap and single. - ALDS A2: 2B Umpire Brian O'Nora's safe call is reversed when injured runner rolls ankle off base. - ALDS A2: 2B Umpire Brian O'Nora's safe call is overturned to a successful pickoff play. - ALDS A2: RF Umpire Vic Carapazza's fan interference and base award (2nd) call is confirmed. - NLDS B1: 2B Umpire Fieldin Culbreth's safe call stands on first RBI of the NLDS. - NLDS B2: RF Umpire Cory Blaser's home run call is confirmed as no fan interference occurred. - ALDS B3: 1B Umpire Mark Wegner's out call stands on back end of a double play at Fenway. - NLDS A3: HP Umpire Gerry Davis' foul ball call stands on review for hit-by-pitch. - NLDS B4: 1B Umpire Jerry Layne's safe call is overturned to give Chicago a late-inning pickoff. - NLDS B5: 2B Umpire Cory Blaser's safe call stands to lead off the first inning of Game 5. - NLDS B5: 2B Umpire Cory Blaser's slide rule violation no-call is confirmed in Washington. - NLDS B5: 1B Umpire Will Little's safe call on pickoff attempt is overturned in the 8th. Totals: 3 Confirmed + 4 Stands + 6 Overturned = 7/13 = .538 RAP. NOTE: There were 16 Replay Reviews during the 2016 Division Series (10/16 = .625 RAP). - ALDS A2: HP Umpire Dan Iassogna's HBP call survives Girardi's failure to challenge the call. - NLDS B1: HP Umpire Cory Blaser rules Zimmerman out for runner's lane interference in the 9th.